Mayor Biskupski charges up an electric vehicle using one of the 28 new Level 2 EV charging ports located across Salt Lake City. Salt Lake City Mayor Jackie Biskupski and DAQ Director Bryce Bird announced Wednesday the addition of 28 new electrical vehicle charging ports across the city. 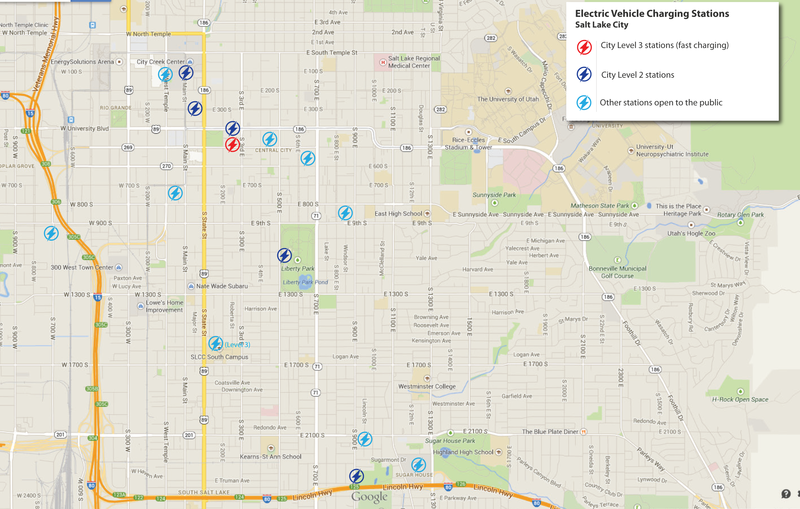 The new “smart” Level 2 EV charging stations are located at 12 sites—new and existing—across Salt Lake City and have replaced five older units. Locations include the International Peace Gardens in Jordan Park, Sorenson Multicultural Center, Sunnyside Avenue near Hogle Zoo, Pioneer Park, the Forest Dale Golf Course, and more. Our winter time inversion season is here, but this year Utah will have more clean, electric cars on the road that are helping to improve our air quality through the U Drive Electric program. The University of Utah’s U Drive Electric program has facilitated the sale of 92 electric and plug-in-hybrid cars in the last six weeks. Due to the popularity of the program, U Drive Electric has been extended through Nov. 30, 2016. The program is offered through a collaboration between the university, Salt Lake City and Utah Clean Energy. 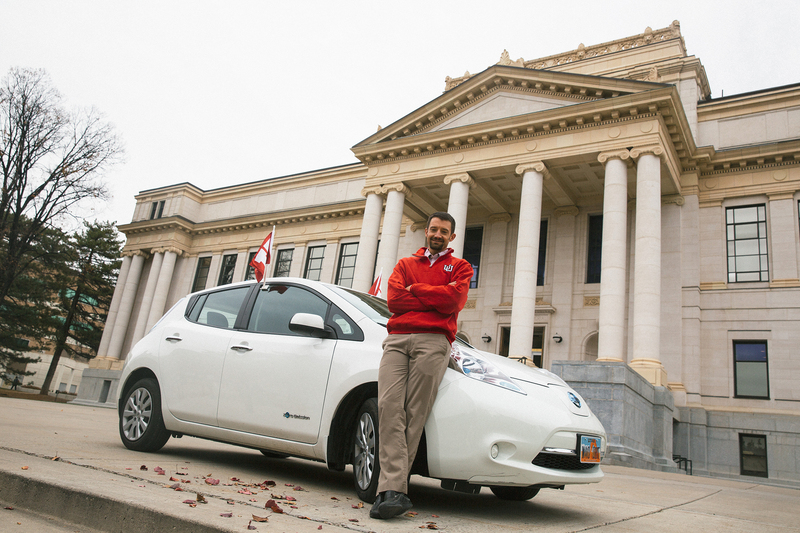 The University of Utah is the first university in the country to sponsor a community-level electric vehicle purchase program that includes discounts on multiple makes and models. U Community Drive Electric offers members of the U community, including faculty, staff, students, alumni and campus guests in Salt Lake, Summit, Weber, Tooele, Utah and Davis counties, the opportunity to purchase or lease electric vehicles at a discount of 5 percent to 20 percent off of MSRP. The limited-time program launches today, Dec. 14, and runs through Dec. 31, 2015. Car dealers are able to offer a discount because these types of community programs tend to generate more customers in close proximity during a specific timeframe. There are three participating car dealers: BMW of Murray, Larry H. Miller Ford Lincoln – Sandy and Tim Dahle Nissan of Murray. There will be a community workshop with questions and answers, Thursday, Dec. 17, 6-7:30 p.m. at the University of Utah Spencer Fox Eccles Business Building on the 7th floor, 7170. This program is part of the university’s goal to implement creative solutions to lessen its environmental impact and to improve conditions for the community and future generations. With almost 50 percent of Utah’s urban air pollution coming from tailpipe emissions, electric vehicles represent an important tool for improving air quality along the Wasatch Front. “We are excited to support U community members’ access to emissions-reducing cars that will improve air quality,” said University of Utah Chief Sustainability Officer Amy Wildermuth. To offer this incentive, the Sustainability Office is partnering with Utah Clean Energy, a nonprofit, public interest organization that works to drive the transition to a clean energy future. The program is enabled by a generous grant from Utah Clean Air Partnership, or UCAIR, which encourages businesses, government agencies and nonprofit organizations to invest in emissions-reducing and energy-efficient technologies. In addition to increasing awareness about electric vehicles’ impact on Utah’s air quality, the organizers of U Drive Electric hope to connect the benefits of combining solar power with electric vehicles. U Drive Electric will also include plug-in hybrids to provide an opportunity for people who require a longer-range option to participate in the program. Including these vehicles maximizes the choices for consumers, which will ultimately help even more community members reduce their pollution. Participating community members will sign up for the program with Utah Clean Energy at www.udriveelectric.org. Once registered, participants work directly with any of the selected dealers to purchase the electric car of their choice. Participants must sign a contract before Dec. 31, 2015, to guarantee the discount. For more information about the U Community Drive Electric program, visit www.udriveelectric.org. The University of Utah is committed to integrating sustainability across all areas of the institution, including academics, operations and administration. Additionally, the university is supporting sustainability efforts and research under the Sustainability Office to better streamline initiatives and collaboration across campus. UCAIR is a statewide clean air partnership created to make it easier for individuals, businesses and communities to make small changes to improve Utah’s air quality. Every small change adds to a collective bigger step toward better health, a better economy and better overall quality of life for all of us. This e2 business profile was written by SLCgreen intern Lauren Mills. Learn more about Salt Lake City’s e2 Businesses. Sitting on a quaint neighborhood corner in downtown Salt Lake is an auto shop decorated with green garage doors and sunflowers printed up the sides. Besides the earthy appeal, one might easily assume that this building is simply your basic auto shop like any other. However, take a peek inside (or outside if you prefer), and you will quickly discover that this little auto shop is hardly your average business. Founded in 1964, Clark’s Auto & Tire began as a typical service location for all vehicles. In 2010, current owner Alan Boyer took over the shop. Having grown up from a young age into the auto business, Alan is nothing short of an expert on all things maintenance—the good, the bad, and the ugly. As a young boy, Alan recalls working in shops and “filling up 55 gallon trashcans of paper and plastic, just to put it in the dumpster.” What does this have to do with running an auto shop? Here’s where Alan’s unique expertise comes into play. After six months of gaining familiarity with Clark’s, Alan made the brave decision to transform the shop into a fully sustainable and eco-friendly auto business. Initially, Alan struggled to find any useful strategies or resources to aid the development of his plan. However, this was hardly an obstacle; Alan simply set to work creating sustainability plans on his own. The results are highly impressive and visible, both inside and out. On the roof of the shop, Alan has installed solar panels that provide 2.5 kilowatts of energy for usage throughout the building. The TV above the front desk is directly powered by this solar energy, and displays a continuous scroll of the shop’s energy consumption levels as a means of keeping inventory. Surrounding the sides of the shop are specified tubs for recycling scrap metal, tin cans, and oil. You are also likely to see several bikes strapped up to posts, as many of Alan’s staff members have hopped on board with his eco-friendly initiatives and now choose alternative methods of transportation to work. Think this is neat? Wait until you look inside. Alan has replaced all the old lighting systems from the previous Clark’s design with energy efficient LED bulbs throughout the shop. In the garages, only a single air-compressor car jack remains on account of limited space. Alan keeps a clean shop as well; in addition to the numerous recycling and garbage bins located around the machines (as you will quickly discover that there is nearly nothing that does not get recycled), Alan ensures that there is zero contaminant leakage from his garage into water drains. In terms of specific auto services, the combination of Alan’s extensive knowledge and his passion for sustainability is what truly sets Clark’s Auto above the rest. The shop offers services and repairs to both gasoline cars and hybrids or electric vehicles (E.V.’s). Perhaps one of Alan’s most impressive services is battery repair: rather than tossing an entire battery to an unknown disposal location (as many auto shops and dealers do), Alan specializes in analyzing faulty car batteries (particularly in hybrid vehicles) to pinpoint the specific problem, repair it, and rebuild the battery to proper functioning power. This saves time, waste, and especially money for the customers. So the next time your car seems to act up on the road, or your battery goes dead, or even if you’re in need of a simple oil change, don’t hesitate to head straight for Clark’s Auto. Because what could feel better than doing both yourself and the environment a favor? Just ask Alan.